At the beginning of the 1980s, the US was Honda's leading market for motorcycles. In order to promote its image, the company went for as many victories as possible in all kinds of motor sport. 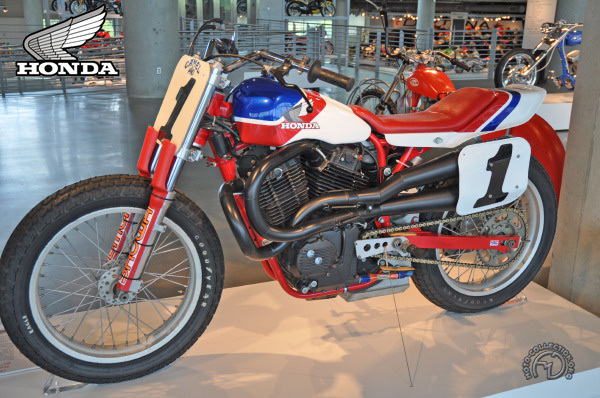 Honda dreamed of adding the National Dirt Track Championship to its honors, but the "Number One" slot was the fiercely guarded possession of Harley-Davidson. Honda's first attempt, with the NS750, developed out of the engine of the road-going 500CX, ended in failure. Dirt-track racing first became popular in the US in the 1920s: because there were no special tracks; it was held on horse-racing ovals. It is highly specialized, with unique wheel geometry and engine characteristics, as the cinder track offers little in the way of grip. Honda realized that the supremacy of the Harley-Davidson 750XR sprang essentially from its mechanical concept, and developed an engine of the same type for its new challenger, the RS750. It had little in common with its American counterpatt except for the engine configuration – a longitudinal V-twin – and used far more modern technology, a favorite ploy with Honda. The RS750, ridden by Bubba Shobert in 1985-86, at last enabled Honda to win the title that the NS750 had been unable to secure despite the talent of its riders Freddie Spencer and Mike Kidd. Honda soon retired officially from the Dirt Track Championship because of new and stiffer regulations, but in 1993 privateers like Ricky Graham were still racing the RS750. The Honda RS750 – shown in 1990, its last year as a works entry – and the Yamaha XS750 are the only Japanese bikes to have won the American Dirt Track Championship.